Jewish history was permanently altered by the destruction of the First Temple, and the exile that came afterwards. The physical destruction wrought by the Babylonian troops was tremendous. The Temple, the palace, and all of the houses of Jerusalem were burnt, the walls of the city were torn down, and the remaining treasures from the Temple were taken to Babylon (II Kings 25:8-17). 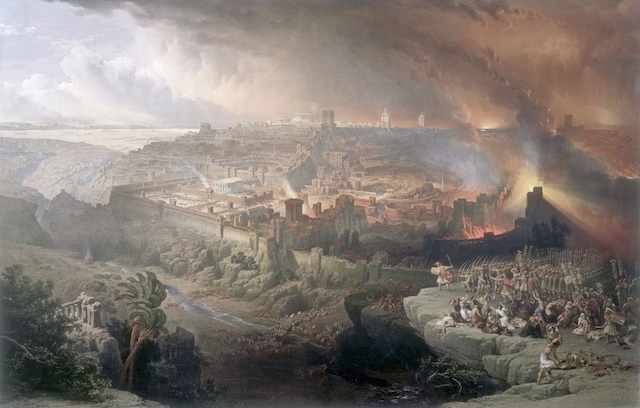 Archaeological evidence shows that the destruction extended beyond Jerusalem to as far as Ein Gedi in the east, Arad in the south and Lachish in the west. These cities, as well as Ramat Rachel, Bet Shemesh and Bet Tzur were reduced to subsistence level villages. The population was diminished through military action and forced relocation; II Kings and Jeremiah differ on the numbers, but they both present a sense of economic and political disruption. Other evidence, however, argues against seeing the destruction of 586 as a major upheaval. While the book of Kings says “only the poorest people of the land” remained (II Kings 25:12), even according to the larger report, the 10,000 people deported would have been a small portion of the population as a whole, albeit a wealthy and socially significant one. Unlike the Assyrians before them, the Babylonians did not settle new people in the destroyed areas; the Babylonian chief Nevuzaradan apparently redistributed some of the land of those exiled (Jeremiah 39:10) to those who remained. Enough people remained to maintain the harvest. Although the Babylonians exiled much of the leadership, some of the local leaders remained. The Babylonians appointed Gedaliah the son of Ahikam to serve in some administrative role over the people (II Kings 25:22); Ahikam had earlier demonstrated his sympathy to Jeremiah, and presumably to Jeremiah‘s pro-Babylonian politics when he saved the prophet from a death sentence pronounced by the priests and prophets after his “Temple Sermon” in the year 609 (Jeremiah 26:24). Gedaliah probably was appointed because he shared his father’s pro-Babylonian sentiments. From his capital of Mitzpah, north of Jerusalem, Gedaliah continued or at least supported the redistribution of land to the poor and those who had fled (Jeremiah 40:9-11). Jeremiah’s report that they “gathered a great abundance of wine and summer fruits” (v. 12) may be historical, but also represents the prophet’s not-so-subtle claim that Gedaliah’s efforts met with God’s favor. Furthermore, the presence of wine and fruit in the harvest indicates that delicate agricultural resources like vineyards and orchards had not been destroyed by the Babylonians. Although Gedaliah seems to have had the support of the people, there were those who opposed him. Ishmael the son of Netaniah, who was serving as a military commander under Gedaliah, assassinated Gedaliah (II Kings 25:25). Biblical texts are unclear about the date (either in the fall of 586 or 585), but in any case, his tenure was very short. The reasons for the assassination are not described in the Bible. Ishmael, who claimed to be descended from David‘s son Elishama, may have had royal pretensions of his own, or perhaps he sought vengeance against the representative of Babylon for the butchering of Zedekiah’s family. Following the assassination of Gedaliah, little is known about the Judeans who remained in the land. Much of the landed elite had been relocated to Babylonia; others, in the wake of the assassination, fled to Egypt, Jeremiah among them. Although II Kings and the book of Ezra describe the total cessation of worship at Jerusalem, other evidence seems to imply that aspects of the cult remained in place. After the assassination of Gedaliah, “some men from Shechem, from Shiloh, and from Samaria, eighty men, having their beards shaven, and their clothes torn, and having cut themselves, came with offerings and incense in their hand, to bring them to the house of the Lord” (Jeremiah 41:5). Around 556, an Aramean named Nabonidus seized the Babylonian throne, and proceeded to alienate many of the Babylonians by elevating his own favorite deity, the moon god, Sin. Soon after, a Persian named Cyrus took over the Median empire in Ecbatana. By 547, Cyrus campaigned in Asia Minor and laid siege to the King Croesus of Lydia in his capital of Sardis. Nabonidus continued to lose support within his shrinking Babylonian empire, and in 539, Cyrus conquered Babylon itself, claiming the assistance of the Babylonian god Marduk, probably after receiving real support from the traditional priests of Marduk in the city. Also among Cyrus’ supporters were Jews like the prophet whose stirring poetry is preserved in the book of Isaiah (chapters 40-55, called Second Isaiah). Notably, Jerusalem is not on the list of restored cities and temples. The book of Ezra, however, does preserve an edict purporting to be from Cyrus authorized the rebuilding of Temple and the restoration of the temple vessels. An embellished form of the edict is found in the first chapter of Ezra in which Cyrus sounds like Second Isaiah, attributing his rise to the Lord God of heaven, using the particular name of the God of Israel. Later, during the reign of Darius, a copy of Cyrus’ edict was found (Ezra 6:3-5); this version is somewhat more reasonable, including dimensions for the temple which was to be rebuilt and none of the language that describes Cyrus as an adherent of the God of Israel. Although the Second Temple was not built for many decades, some of the exiled Jews did return from Babylon. Upon their return, conflicts developed between the community of the returnees and that of those who were left in Judah. The exilic experience had apparently been a fertile one for religious developments, and the two communities had diverged in ways that would have a formative impact on the shape of all later Judaism. The historical importance and practical history of rebuilding ancient Judaism's sacred center. Who Were the Tannaim and Amoraim? The great sages of the Mishnah and Talmud.